So recently went Grocery shopping and spot this Chocolate syrup on the counter, so I picked it up, paid and went home. My kids Love Cupcake, so I made some batch for school snacks Tomrrow. Below is the Recipe for this moist fluffly yummilicious cupcake. Being that it’s my first time to use the syrup, I added little just to check out the end product. Whip Margarine and sugar in a mixing bowl and use a hand mixer to mix it for 20 mins. Add Eggs one after the other and mix for 10 mins each. Add in sieved Flour and baking powder, desiccated coconut, salt, milk flavour and mix on low speed for 5 mins. Add in Rum and Butterscotch flavour, mix for 3 mins, and lastly fold in the Hershay’s Chocolate Syrup and mix for 3 mins or until well incorporated. Heat your oven at 150°, Line your cupcake pan with cupcake paper. 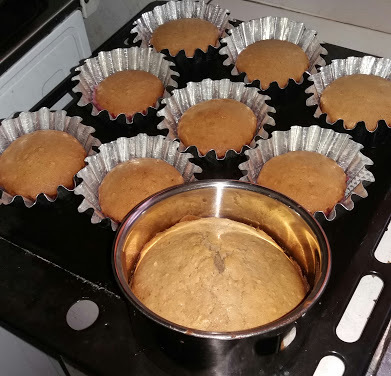 I used a locally made cupcake cups. Fill in with a piping bag or scoop with an ice cream spoon if you have one. Bake for 45mins or until it’s done, you can do toothpick test.